Chelsea Green is located at 4120 Kamloops Street in a quiet part of East Vancouver. It was built in 1989 by the West Coast Community Homes Society and was acquired by New Chelsea Society in 2010. Within walking distance of the Nanaimo Skytrain station, Chelsea Green offers a cozy neighborhood feel with convenient access to the rest of the city. 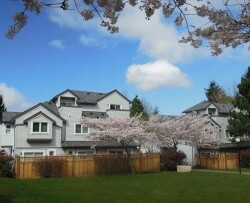 29 private and self-contained family townhouses; 2 and 3 storey units. Common area in community building for activities. Access to Nanaimo Skytrain station. Laundry rooms and plumbing hookups for laundry in townhouses for residents who bring in laundry machines. Rent geared to income; tenants pay 30% of gross household income; with no cap.